he Invacare Divided Leg Slings come in four sizes to meet a variety of client needs and the new improved overall design makes them all easier than ever to position. The Invacare Divided Leg Slings accommodates transfers from a bed to a wheelchair, recliner or shower chair.. The new improved overall design makes them all easier than ever to position. The slings feature a unique, fully padded fabric that forms a soft yet supportive surface. The soft-brushed lining helps prevent sliding for ultimate comfort and skin protection. And the new stretch-resistant feature means the slings will hold their shape, for superior support and ease of positioning. Perfect for users who are totally or partially dependent, non-weight bearing, very heavy or have limited head control. 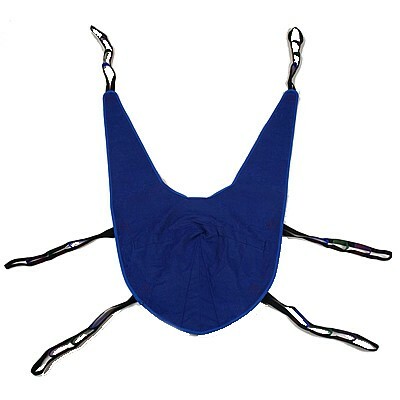 This sling can be used with the Invacare I-Lift Series Lifts and Invacare Reliant 450, 600 Lifts. Petite (R100P) Overall Length: 59.8", Back Length 29.2" / Width: 33"
Medium (R100) Overall Length: 62.8", Back Length 35.7" / Width: 37.5"
Large (R101) Overall Length: 67.8", Back Length 41.7" / Width: 41"
X-Large (R102) Overall Length: 72.3", Back Length 43.2" / Width: 44.5"